The New Nissan Leaf. Looks just like a Nissan. There’s a new Nissan Leaf coming in February. It looks a bit like a car and not at all like the old Nissan Leaf. The old Nissan Leaf reminded me a little of one of those shinkansen bullet trains in Japan. A little. A very little. This new one looks more like a Nissan. This is either a good thing or a bad thing depending on your view of Nissans. 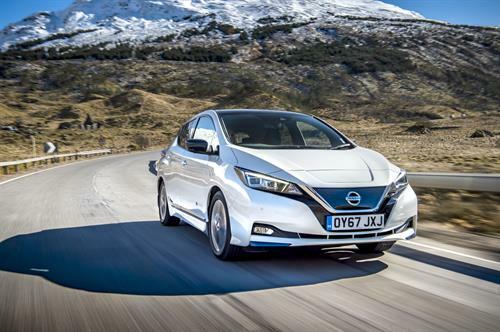 I haven’t checked with Nissan about its wiper motor and whether it’s an especially quiet one like the one on the old Nissan Leaf but that sort of thing is likely. Electric is becoming more normal. There are quite a few Teslas knocking round Cambridge now, if electric cars knock around anywhere. I’ve seen fewer Renault Zoes than I have Teslas but they do pop up from time to time. One of my chums has the current Leaf. There may be electric Golfs but since they look just like any other Golf it’s hard to pick them out. The new one has a more powerful 150PS motor than the old one and the batteries give you a longer range. Nissan claims 235 miles on the NEDC, if that means anything. It probably doesn’t mean more than it will go quite a bit further than the old one. Prices are surprisingly low thanks to a government grant of £4,500. They start at £21,990 for the Visia which is only a small increase on the current model for what is a car with a lot more power and a longer range. The top of the range is the Tekna which will cost £27,490 after the grant and there are a couple of steps in between including a special limited launch edition called a 2.ZERO with quite a lot of nice toys. So, still normal.